This is my HummZinger Ultra Feeder Review made by Aspects which we have been using for 6 seasons now. The HummZinger Ultra has a built in Ant Moat, there are 4 feeding ports with raised flowers to divert rain from the nectar, it can be hung with included hook or it can be pole mounted, has a capacity of 12 oz., is leak-proof and has a lifetime guarantee. This is the package of the HummZinger Ultra. The box is rugged and enough so that I reuse it for storage between seasons. The Ultra is packaged in parts but very easy to assemble. a "top" and a "bottom" which comes apart for easy cleaning. a "hook" which screws into the bottom to hang the feeder. some nifty bee/insect guards which slip over the bottom of the feeding ports. This is a photo of the Underside of the top with a Bee/Insect Guard. The guards can be installed by choice. You simply slide the soft plastic tips over the bottom of the feeding ports as shown. I like this because if you don't need them you don't have to use them. This is helpful because when using the tips they need to be cleaned during the cleaning process which takes a bit longer. The only negative feature I found is that the ant moat is rather small and may need to be refilled between cleanings if the feeder is in the sun. However, I have never found a hummingbird feeder with a built-in ant moat that was large. I kept the feeder in the shade and didn't need to refill the ant moat between cleanings. I would recommend using a separate "Ant Moat" with a large capacity. Our hummingbirds took to this feeder within hours of the first time I hung it. I like the 12 oz. capacity. I do not waste much nectar between cleanings. Some may find the need to clean the feeder more often especially if it is exposed to direct sunlight. 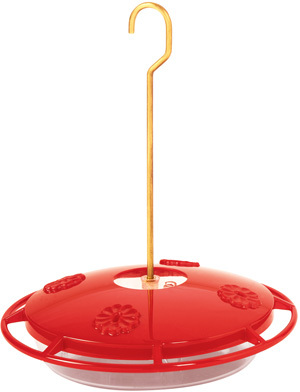 In this case, there are smaller HummZingers available such as the ASPECTS153 - HummZinger Mini Tray Hummingbird Feeder - or the ASPECTS382 - HummZinger Little Fancy Rose Feeder line which has an 8 oz. capacity. 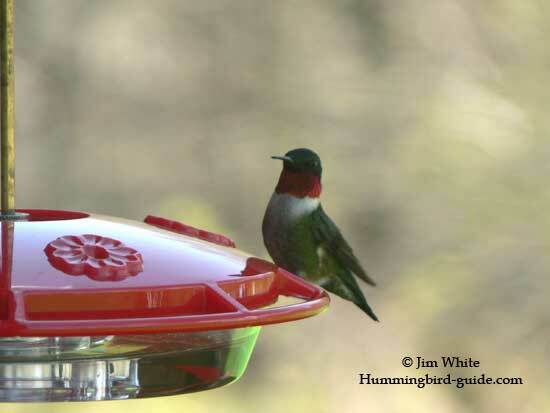 Some of you "lucky" ones may have large numbers of hummingbirds at their feeders especially during the migration. In this case, Aspects has a large 16 oz. capacity feeder called the ASPECTS143 - HummZinger Excel Feeder. 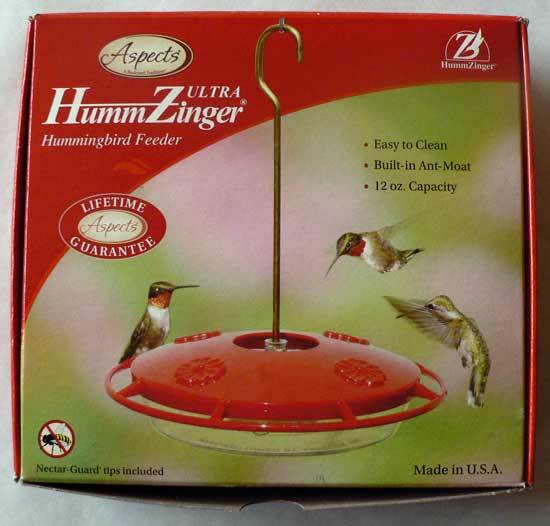 I would definitely recommend the HummZinger Ultra Hummingbird Feeder. 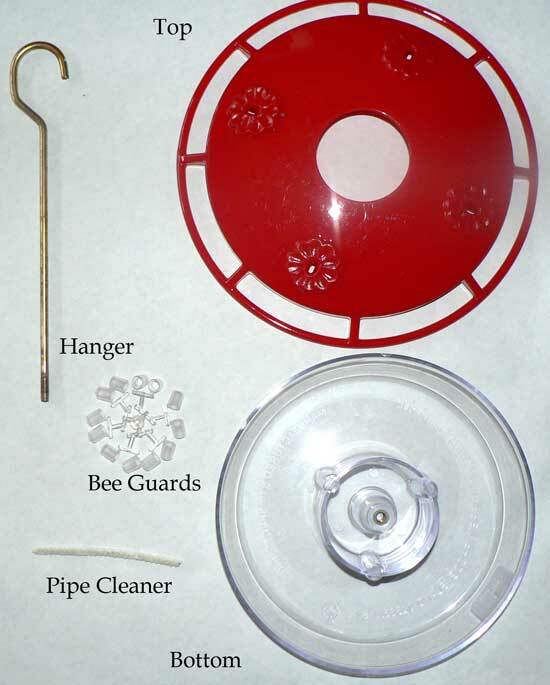 I can personally attest to the "Bee Resistance" of the HummZinger feeders! 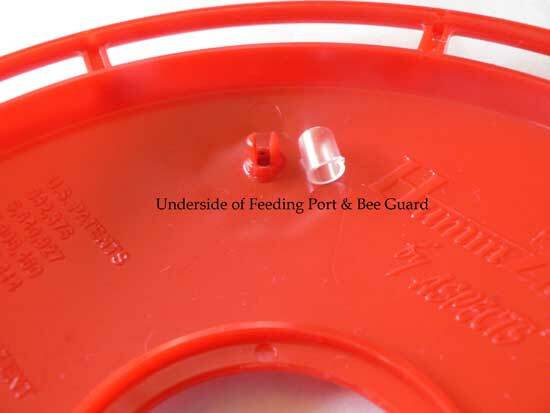 The bees did not take over our HummZinger Ultra feeder even without the "Bee Guard Tips" because the nectar level was low enough to prevent the bees from reaching it when they stuck their heads through the feeding ports. The nectar, however, is easily accessed by our hummingbirds because of their long tongues!